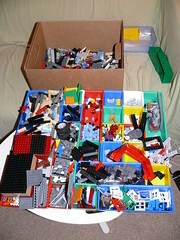 When sorting LEGO there are two main approaches: sort by color, and sort by shape. When I first started building as an adult, over ten years ago, I sorted by color. But I found that a lot of the time, I was digging through the monochromatic bins in search of the part I wanted. It was pointed out to me that it would be a lot easier to find a part of a particular color among identical size/shape parts of all colors, than to do the opposite, as the human eye is much better at spotting colors than shapes, and when parts of different sizes are mixed together, the small ones tend to settle to the bottom, falling through the voids between the larger parts. 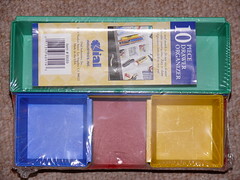 I actually employ a hybrid system – for the basic bricks, I sort them by color, putting each color into a bin with each individual size brick in a baggie in that bin. 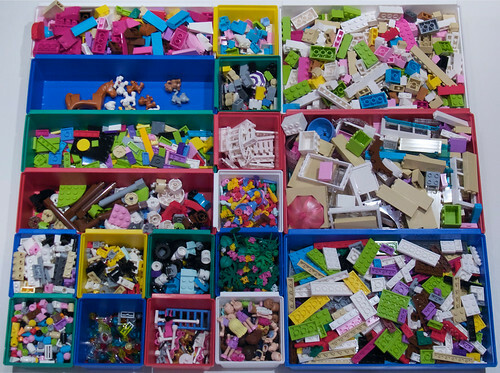 When I sort, I dump all the bricks of that color into the bin, and at some point later on, like when I am building using that color and there are a large number of loose parts in the bin among the baggies, I will go through the bins and sort them into their bags. 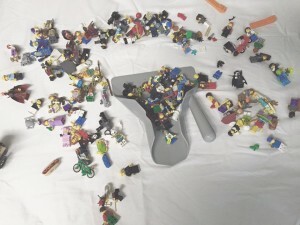 For most other parts though, they’re just sorted by size/type, with parts of different colors mixed together. LEGO master builders have a fully sorted-out system, where they have a bin for each color/part combination. But that’s how the parts come from the factory, and they never have to sort – they just throw parts on the floor and they get swept up and recycled! To facilitate sorting, it’s just not feasible to sort down to that level of resolution, and it would take up too much space to store it that way anyway. So at some level it is necessary to mix parts together in the storage bins. This all works well when the distribution of colors is fairly even among the pieces in question. But when there are hundreds of parts in the most common colors mixed with a handful of parts in rarer colors, it’s really hard to find the rare color parts… or even to remember that they exist. This is compounded by the fact that LEGO doesn’t produce all parts in all colors; for example, there is no dark red 1×3 brick. So some time ago, I started separating the colors into different classes … the primary colors (black, white, red, yellow, green, blue, light grey, and dark grey) and all the others (the lighter and darker colors, orange, purple, etc.). In most categories, categories where color matters (bricks, plates, tiles, etc.) I have parallel sorting/storage systems for these two color groups. The rarer colors are in bags or bins (depending on how many there are of each) separate from the main colors. For parts where color isn’t as important (Technic parts, small decorative elements, hinges, clips, etc.) they are mixed together with other parts of the same type without regard to color. I’m in the midst of a sort now, as I had a large amount of unsorted parts from taking apart some sets I had bought recently, and am being reminded that my color sorting solution is not quite satisfactory. So I’m throwing this topic open … any ideas or suggestions? LEGO Studio in a Trailer?